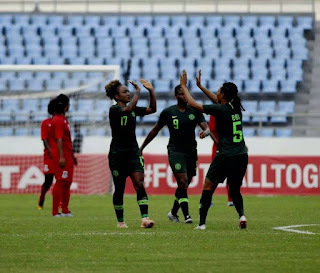 The Super Falcons were on a goal-scoring spree on Saturday as they decimated Equatorial Guinea 6-0 in their final group game at the ongoing Women’s Africa Cup of Nations in Ghana. Though it was largely a one-way traffic, the Super Falcons players performed at different levels with some hitting the right note fast and other still struggling. 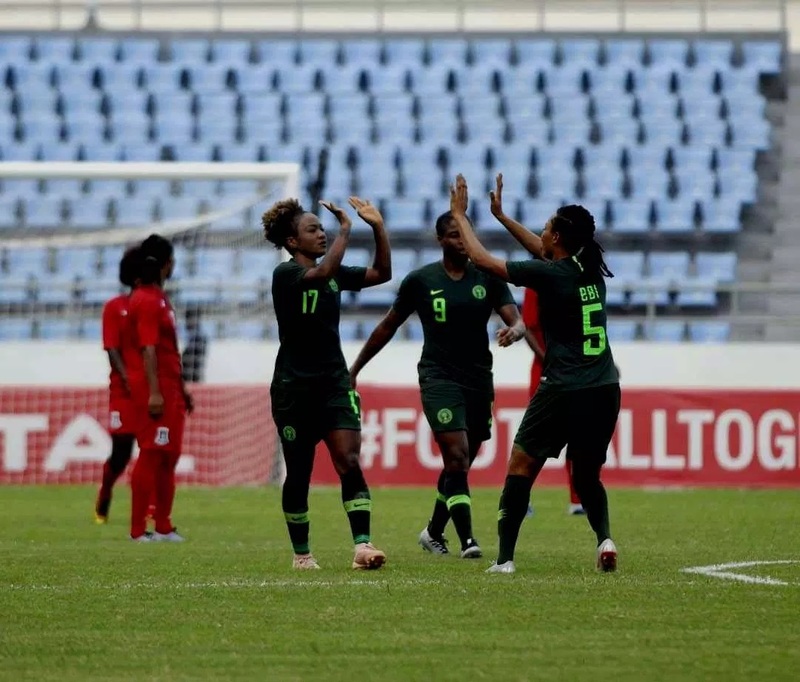 PREMIUM TIMES gives an assessment of how the Super Falcons players fared against Equatorial Guinea. Virtually on holiday all through the 90 minutes, the Rivers Angels woman had very little to do. That nonetheless, it is not out of place to credit the only home-based lad in Nigeria’s starting lineup for proper organization of the backline which largely kept the Guineans at bay with virtually no shots on target. The right-back gave a commanding display in the defence and she also expertly linked up with the attack particularly with Oshoala on the flanks. The Vaxjo centre-back had a good partnership with Onome Ebi at the heart of the defence. The Equatorial Guineans were really no match for Nigeria and with Onome standing tall in the heart of the defence they had little or no opportunity to pass through at goal. The Barcelona defender was as always confident on the ball and she handled the Guineans with so such ease before she gave way having sustained a sight knock. Quite energetic all through, the captain led by example; scoring a goal and also provided an assist. However, she has some drawbacks when it comes to set pieces. Ayinde was in beast mode literally; blocking and quashing any attempted moves by the Guineans. With three goals to her name, Oshoala cannot be denied the top honours even though it is obvious she is still yet to enter full gear. Quite mobile on the ball, Okobi provided a great display against the Guineans. Another good game.. The powerful forward contributed a goal and an assist in the match. Her dashing runs, dribbling skills, pinpoint passes are all sources of worry to opposing teams. Against the Guineans, she did all again; scoring, providing assists and much more. A solid display on the part of the hardworking midfielder who offered solidity to the Falcons team. The Nasarawa Amazons star came on for Desire Oparanozie and showed some flashes of brilliance. Unfortunately, she missed a sitter moment after she was introduced to the game. The Ibom Angels defender did not perform badly in her primary assignment of covering up at the back and also help the attack when needed.